Steve Snyder graduated from UCLA with a B.A. degree in Economics and has lived in Seal Beach, California since 1972. After 36 years in national sales and sales management, he retired from Vision Service Plan (VSP) in 2009. Soon after retirement, Steve began his quest to learn about the World War II experiences of his father, pilot Howard Snyder, and his crew of the B-17, Susan Ruth, named after his older sister. It became his passion, and after 4 1/2 years of dedicated research, resulted in his book, SHOT DOWN which has received over 20 national book awards. One result of his new career as a World War II historian is that he is a member of numerous World War II organizations and President of the 306th Bomb Group Historical Association. For most, 70 years is a long time ago. World War II fades in importance as each year goes by. 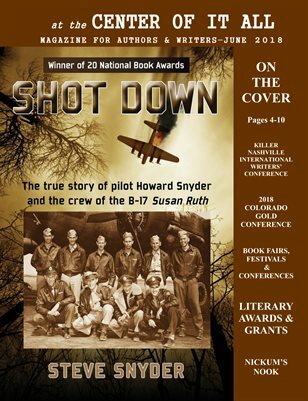 Shot Down moves history out of the footnotes into reality, keeping the stories of real people alive as they experience being shot down. You are there, almost holding your breath as Lt. Snyder gets his crew out of his B-17 when bailing out over Nazi occupied Europe. A great introduction to the history of the U.S. air war in Europe, humanized by the experience of a single bomber crew. Snyder’s masterful book puts the reader inside the cockpit, shoulder to shoulder with the pilot and crew. Accessible and relevant both to historians and readers with a casual interest in WWII history, Shot Down a must-read for anyone with an interest in this gripping period of American history. Highly recommended for historians and WWII aviation buffs, it’s a thoroughly satisfying and worthwhile read. Extensively researched, packed with photographs, and neatly interwoven with background remarks, this highly engaging book offers a comprehensive, yet personalized portrait of a war. A masterful work. Enjoyable for those interested in the Eight Air Force and/or the B-17 Flying Fortress, but it is also broad enough to appeal to general history readers. Insightful, engrossing, and succeeds on every level. Bravo. A magnificent job. Readily accessible to anyone not familiar with the bomber war in Europe, but also much to interest those whose real passion is wartime aviation.